I often hear people running their own businesses say that they’d like to write more blog posts, but they just don’t have the time. I don’t think it has to be that way. So I’ve set myself a challenge. Can I write this blog post in one hour and show you how to do it too? The clock is ticking. Or rather, the timer on my phone is counting down, so let’s go. Where do ideas for blog posts come from? I read, listen and watch the news. I browse the web, read articles and blog posts. When I find something interesting I stick it into a swipe file or a notebook. Stick your ideas into an online pot, like Evernote or OneNote and they’re accessible any time anywhere. Or keep a notebook and jot them down at the back. Just make sure you always have it with you. Ask your friends, family and community what they want to hear about. Even if you only have a small number of followers or subscribers to your mailing list or blog, a few ideas from them are better than none at all. Don’t wait for inspiration to strike. You may find you’re waiting a long time. The more you go looking for it, the more you’ll find. 10 mins gone and I’m well into creating content from one of my stored ideas. What does a blog post need? Applying a structure can help you focus on what you need to get the job done and stop you getting side tracked. Image – I can go to my file of images on my laptop and use something like a picture of my desk. Or I can spend 5 mins looking for rights-free images on a site like pixabay or pexels.com. I’ll do that in a few minutes. Content – well that’s what I’m doing now. Typing directly into WordPress, or a simple text editor such as One Note or Evernote. I usually type in Word, but I don’t want to be distracted by too many formatting options and I know that when I copy and paste into WordPress, it does some wonky formatting that I’ll have to reset. So keep it simple and avoid having to spend time re-formatting. You may think that writing posts to a formula or template will get dull and boring. But most well written stories on the web, including news stories, are written to some kind of template and chances are you’ve never really noticed. A template, such as headline, lead paragraph, content, conclusion gives your writing a structure and direction. That keeps you focused as you’re writing it and helps make it easy for your audience to read too. Applying a formula is one way to help you write blog posts quickly and consistently. Once you’re up and running, and have built your confidence, then by all means play around a play around a little and try a new one. If something works well for a post – then repeat it. I’m not working through my list in the same order that I’ve written it. The first thing I’m working on is the content, what I’m writing or typing right now. I’m not particularly crafting each line as I go, just getting my thoughts down in some kind of order. When I have my first draft complete, I’ll go back and tidy up any spacing, capitalisation, spelling and grammar problems. And I’ll start formatting headers and sub headers in WordPress too, to make this easy to read. Next up I’ll go and hunt out that image and place it in the post with a description and alt tag (because that’s good for SEO). We’re all busy. We all have lots of things to do. But the truth is that we all have the same number of hours in a day and days in a week. It’s what we choose to do with them that differs. If writing a regular blog post for your business is important to you, then make time for it. Schedule time with yourself, just like you would for a meeting or a call with a customer. 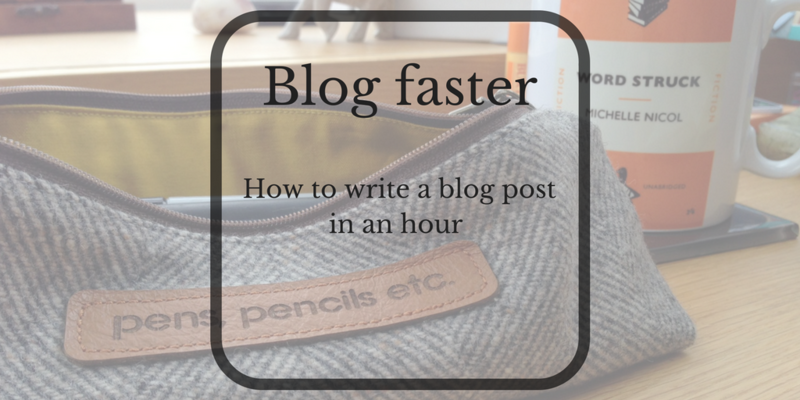 Commit to writing a blog post in a regular time slot and see how productive you can be. That means no phone calls, no sneaky peeks at social media, no email checking. Just focus on your appointment to get that blog post written. Once you get in the flow, you may find that you can get more done more quickly. And get smart. If you do find you have a chunk of time, and you’re in the flow, why stop at one? Write two or three and get them scheduled ready to post. If you don’t have a block of time all in one go, then break it up into chunks and do a bit at a time. Say you have ten minutes on Monday – use that to fill your inspiration file. Another ten minutes on Tuesday? Start sketching out the content for your blog post, do some more research or look for images you can use. Okay. Content’s written. I’ve got an image. How am I doing for time? Time to review and check and see what this post looks like. I spotted a few errors and tidied up some bullet points and formatting. I’ve also time to do a quick review of SEO, looking at keywords. I use the Yoast plugin to help me. Okay, just a few minutes left now. Time to preview and check again and to write a quick line to introduce this on my social sharing platforms. Now, time for the truth. Was this helpful to you? Did you find it useful? Let me know in the comments below. For more business writing and marketing tips like these sign up to my mailing list. Will twitter lose its character over more characters? Emergency back-up blog post – do you have a lifeline ready? This is brilliant, Michelle. Thank you – a great resource. Thanks Katherine. I love it when people find my posts useful. Really helpful! I love the ‘format’ bit. It makes it much easier, and I think readers feel comfortable with a style and that’s what brings them back. I’m going to try the one you’ve suggested to see if it works for me too! Thanks Tracey. It is sometimes a bit of trial and error to see what works, but most people find that having a format helps get over that ‘what do I write’ panic. This is fantastic, and something I *really* needed. I can get completely perfectionistic and spend WAY too much time crafting posts. Thanks Kim, it’s great to hear this is something that will help you. It’s hard to let go of that desire to make everything as perfect as possible. Setting a deadline is a good way to make you do it! I really like this. I’ve got a couple of scribbled put blogs that need typing up, shaping and formatting. I’m going to wok to this template – I’ve a feeling it’ll be very useful. Thanks! Thanks Paula – and good luck with those blog posts. Will you let me know how you get on? Great blog post – so many useful tips. Thank you! Thanks Julia – I’m so pleased you found this useful. Great article. Will help me improve my next blog hugely. Thank you.